For those of you facing challenges in the coming year may you keep on climbing http://www.youtube.com/watch?v=NG2zyeVRcbs the path that's right for you and may it lead to happiness. Please if you can remember to enjoy the view as you go. There will come a time when you can break free from the dark clouds that sometimes gather and once more begin to appreciate the simple pleasures in life which are so important and are so often free but absolutely priceless. From my humble experience I have found you have strength inside you, more you than you can perhaps ever imagine to achieve your hopes, your dreams, your goals. 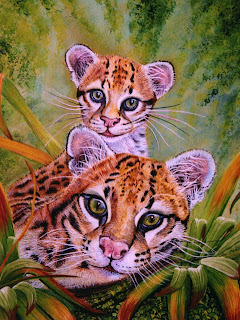 You have so often lifted me onto your shoulders and supported me, just like the Ocelot cub in my painting with its Mum. I have been in a tranquil special place, my Christmas came early for me. Thanks to the love and understanding you have all shown to me, I have come into the light. 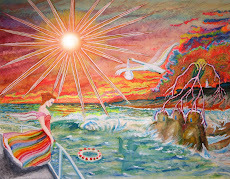 The eloquent Lori D recent excellent posting http://lorisrevival.blogspot.com/2009/12/of-pink-clouds-pebbles-and-mountain.html mentions a pink cloud, the euphoric spiritual life affirming experience I have felt since my surgery. Sadly in reality, life away from my misty pink clouds, the world can be a cruel place. So often endangered animals like the beautiful Ocelot in my painting are killed out of ignorance and selfish cruel needless stupidity. In their case for their skins so that ugly women can wear them, the Ocelots natural habitat destroyed by mankind. The painting reminds me of the wise words I heard at a talk given by one of my friends on "The Ark" Botswana's wildlife. In the end, we conserve only what we love. We only love what we understand. We understand only what we are taught. 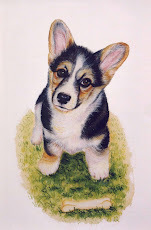 I have not had much time to access a computer in the last few months and have only fleetingly been able to catch up with our friends blogs. 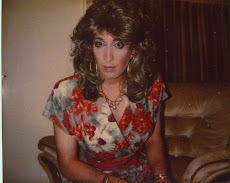 I was in hospital while many of my dear friends attended the transgendered day of remembrance http:///www.transgenderdor.org/?p=62 I recently caught up with Jo's blog and her very moving post about the tragic death of Andrea Waddell. She courageously found herself only to have her life so sadly taken. She was dearly loved and will be sadly missed. She had done all she could to live her dreams, to live a "respectable life", but out of ignorance society denied her the chance to live that life. God rest her soul. Reading Andrea's story and the plight of the loved ones she left behind, moved me to tears and bought me down from my pink misty clouds with a bump. My thoughts turned to all of those who have tragically lost their lives in 2009 particularly those who have faced prejudice and ignorance while trying their best to do what they believed in, the innocent victims from all walks of life. Not just the transgendered , people such as the brave men and women solders who have sacrificed their lives so that we may be free and also the innocent civilians caught up in those conflicts. Remembering these dear souls taught me a lot and reminded me how fortunate I am, how precious life is and how vulnerable we all are. How I wish we could all live together peacefully acknowledging and rejoicing in our differences, living in harmony, with love and understanding. At this time of the year we all have our hopes and dreams for the year ahead. Our journey through life, our climb may face many challenges in the future. May your vision be clear & there be no limit to how far your heart can see in 2010. I wish you all the best in 2010, and hope that we can meet soon. I am down in Brighton early In Jan so if you want to drop me an email, and feel up to it, you can get me via my blog. 2009 has been a triumph for you Debbie. Such strides forward, and such demonstration of what's possible with self belief and courage. You are an inspiration. And 2010 if goping to be even better for you, I just know it! Thank you for sharing all the good and the bad in your life. You've proven to me that anyone can climb nearly any mountain. I'm still climbing and I won't descend until I've reached my own summit. Bless you in 2010! I wish you all the best for 2010. You've certainly proved that if you believe you can do anything, you really are an inspiration. I have to agree, your courage and self belief are an inspiration. All the best Debbie for 2010. Congratulations for your transformation this past year and best wishes for the new year to come. 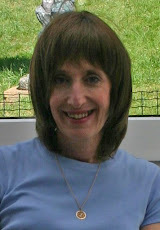 Thank you so much Chrissie, Jo, Lori, Anji, Karen and Caroline for your very kind comments. P.s. Sorry for the lateness of my comment. I'm behind with everyones blog's.